I caught up with Texas Stars GM Scott White Tuesday afternoon after the signing of Maxime Fortunus was announced. We chatted about that and also some of the roster openings still remaining in Texas. "Obviously Max had options. He's at a point in his career where there are family and financial decisions. At the end of the day, our offer was very competitive, a two year AHL contract. He knows where he'll be for the next two years. He will go to Dallas in camp and do his best there." "You never know whatever occurs down the road in terms of needs for the NHL. He still has that, but he has family and [job] security issues. With his kids and wife, they are very comfortable in Cedar Park. It's a great place to live. His oldest is five or six and getting into school. Max can solidify himself in this area with this deal." "I think term was there, but there were other offers out there and he was very comfortable with the Texas and Dallas Stars. He's been with us for a long time and knows what we're all about. He's been a big part of our success from a depth perspective. He's been a big part of our success, and he's a good leader, good for the younger players on and off the ice." "Max is a fit guy. He was dinged up a bit last year, but it wasn't because he wasn't a fit athelete. I think he'll come back in even better shape this year." "He's a player that is going to have to establish himself. He has pace and skill, but he's a little undersized. He plays the game the right way, but it's really in the player's hands to take advantage of the opportunity. He's got to be ready when the time comes. Mike Hedden went through it when he joined up. Ranford had a good development camp but so did a lot of other guys. It was more about getting them introduced to the Dallas Stars as an organization." "You know me, I always like to have more depth and a lot of different guys. If we can tweak it a bit by adding more depth and players that spend time in Idaho, that's what we'll do. If it's a player who can add depth, there's a long time between now and the end of the regular season so you never know. If the right player is out there, we may add that player. Other than that we are pretty good with numbers right now." "I evaluate those case-by-case but right now I'm running with the status quo. Obviously Brad Ralph is working with a lot of players because many fall through the cracks with finding AHL jobs. I'm constantly talking, emailing and texting player reps to see who might still be available. You keep your eyes open. The players that you mention, I don't see them in the mix at this juncture. " "It's a good core group and I like that we're brining some youth into it as well. Now the coaching staff just has to manage them accordingly over the schedule and put the team into the playoffs. It's a long year and it's all about guys managing and taking advnatage of opportunities. That's what you need in a dev setting." "Willie and Doug will be prepared and the players will compete. The coaches believe that the work ethic needs to be top notch and that will give them a great chance for success." One of the longest-tenured Texas Stars will be returning for two more seasons as Texas announced this afternoon that they have signed captain Maxime Fortunus to a two year AHL only deal. It turns out Fortunus was the veteran defenseman that GM Scott White had been looking for, and he didn't have to go very far to find him. The 29-year old Quebec native had made a decision to test free agency coming off a two-way deal with the Dallas Stars. Fortunus played a few NHL games in the 2009-10 season for Dallas. With the expectation that Jordie Benn could stay in Dallas among the likely stable of eight defensemen there, the AHL Stars needed a veteran presence to guide youngsters including sophomores Oleksiak and Nemeth and rookies Klingberg, Jokipakka and Boutet. It's an interesting signing for the Stars, who were at one point looking for a veteran defenseman who could push the NHL roster. They appear to have gotten that and a little bit more with Jordie Benn, who is anticipated by some to make the NHL out of camp. Needing to backfill that veteran gap, Fortunus fits the bill. The term of the deal leads me to believe that the Stars are investing in Fortunus's leadership abilities following the success of last season under his captaincy. Two year deals are rare in the AHL mostly due to the constantly shifting rosters. Texas has had only two in its history, both captains. Landon Wilson signed a two year deal but only played one season due to injuries. Fortunus joins Luke Gazdic, Francis Wathier, Travis Morin and Colton Sceviour as first-year Stars to remain with the club through its fifth season. 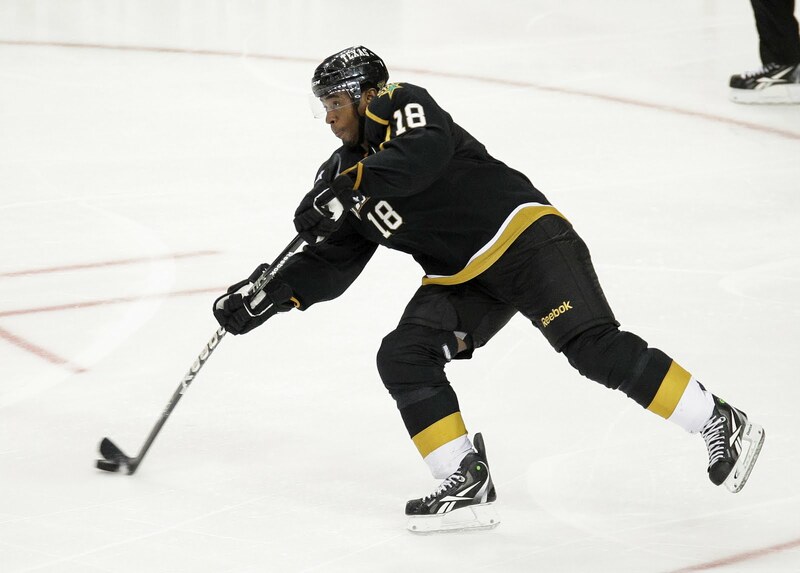 The Texas Stars announced today that the club has signed defenseman Maxime Fortunus to a two-year standard American Hockey League contract through the 2014-15 season. 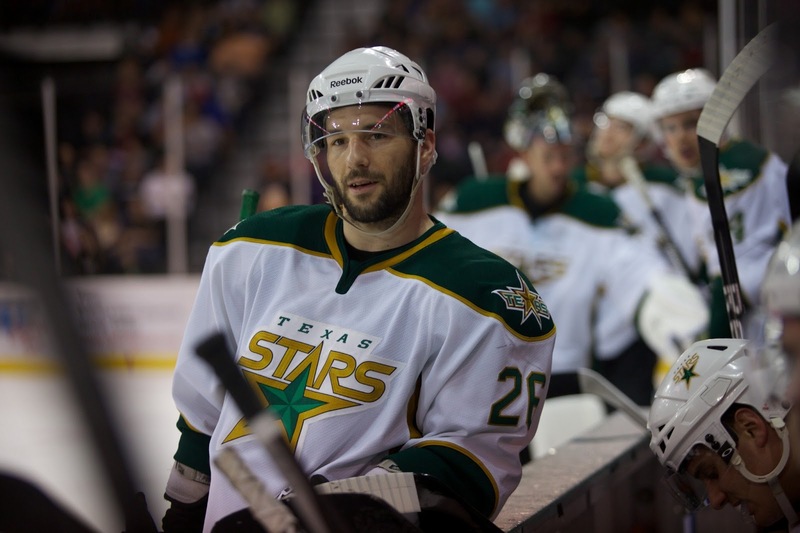 Fortunus, 29, is a member of the Original Texas Stars, having played all four years of the franchise's existence. The La Prairie, Quebec native was selected as the Stars' third captain in team history on October 12, 2012 and had 28 points (7 goals, 21 assists) and 16 penalty minutes in 67 regular season games during the 2012-13 season. 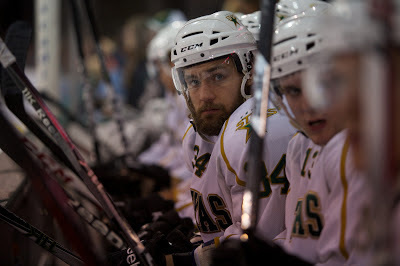 Fortunus also appeared in all nine Calder Cup Playoff games for Texas, registering one assist and two penalty minutes. Undrafted after playing parts of five seasons for Baie-Comeau Drakkar of the QMJHL, he has played in 699 career professional games over the course of his ten pro seasons, including 568 career AHL games with 180 points (49 goals, 131 assists) and 234 penalty minutes in his AHL career. 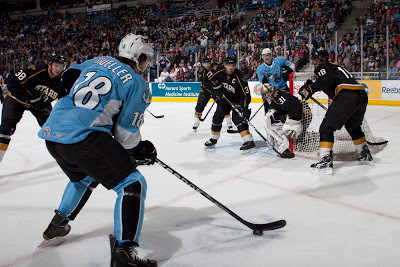 Fortunus has also played in 94 career Calder Cup Playoff games, reaching the Calder Cup Finals in back-to-back seasons with the Manitoba Moose (2009) and Texas (2010), both times losing to the Hershey Bears in six games. 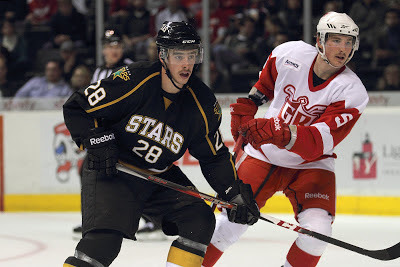 He made his NHL debut with the Dallas Stars on December 18, 2009 against the Detroit Red Wings and has appeared in eight career NHL games for the Stars. Fortunus has appeared in 272 career regular season games for Texas, which is the most of any defenseman in team history and ranks fourth overall. He leads the franchise amongst defenseman in almost every offensive category: goals (29), assists (76), points (105), power play goals (11), power play assists (31) and shots (410). Fortunus ranks fourth overall in assists and points, fifth in shots, ninth in goals and 13th in penalty minutes. He is one of only three players, along with Colton Sceviour and Francis Wathier, to play in all 39 Calder Cup Playoff games in Texas Stars history. The Texas Stars announced this morning that they have locked down two of their AHL contracts for the coming season, both re-signings, as winger Mike Hedden and goalie Josh Robinson rejoin the fold. Hedden, who is entering his third year with the club, is a key signing for the Stars' top six. His combination with Justin Dowling during the last season was an engine for success for the club. Both are now back under contract. 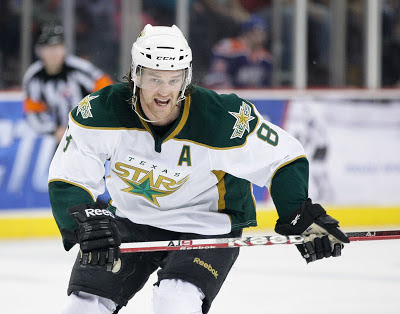 "Mike can take a bigger bite here," said Texas Stars GM Scott White. "The trade (sending Matt Fraser and Reilly Smith to Boston) opened up opportunities in our top six. Fortunately, [Hedden] was still available. He can seize some key minutes for us next year." Texas also locked down their goaltending depth. With the departure of Tyler Beskorowany, the team has a definite number five guy in Josh Robinson. 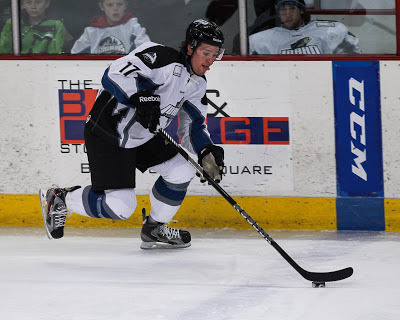 Robinson was a rookie last year in the ECHL and was lights out for the Steelheads (27-8-1-3). White is looking for Robinson to continue that depth role in Idaho and be ready for the callup if the time comes. Robinson did not get into an AHL game last year. 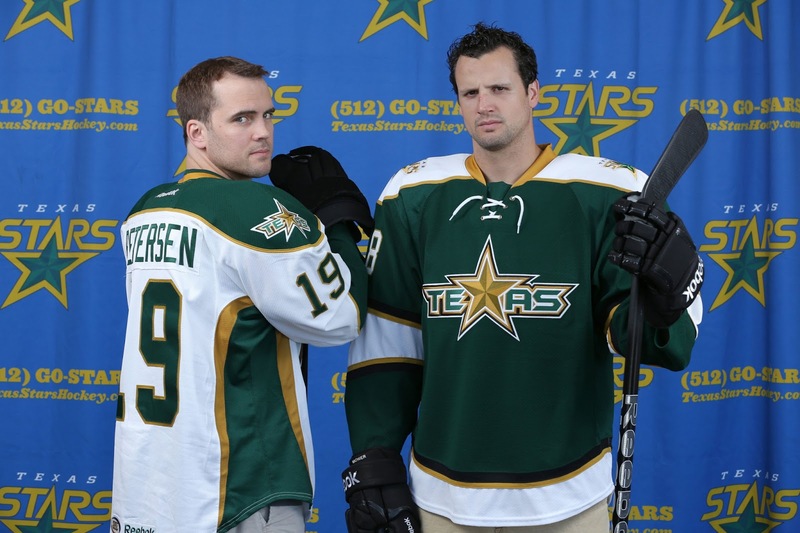 The Texas Stars announced today that the club has signed both left wing Mike Hedden and goaltender Josh Robinson to one-year standard American Hockey League contracts for the 2013-14 season. Hedden, 28, returns for his third season with the Stars after finishing tied for fourth on the team with 35 points (13 goals, 22 assists) during 2012-13, along with 38 penalty minutes and a plus-eight plus-minus rating. 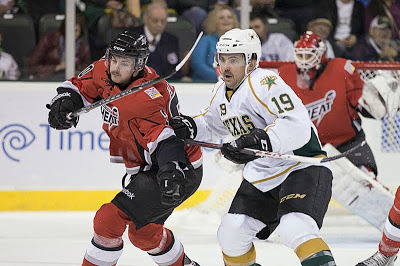 The Dunnville, Ontario native saw his first career AHL post-season action during the 2013 Calder Cup Playoffs and was tied for second on Texas by scoring four points (1 goal, 3 assists) in nine games. Over the last two seasons, Hedden has appeared in 130 career AHL games for the Stars, which ranks 14th on the team’s all-time list, and has 69 points (32 goals, 37 assists) and 93 penalty minutes. He ranks sixth in franchise history in game-winning goals (7), seventh in goals, ninth in points, 11th in assists and 12th in shots (212). 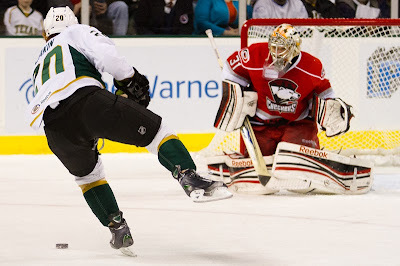 Hedden holds the distinction of being one of just two players in Texas Stars history, along with Colton Sceviour, to score a penalty shot goal. 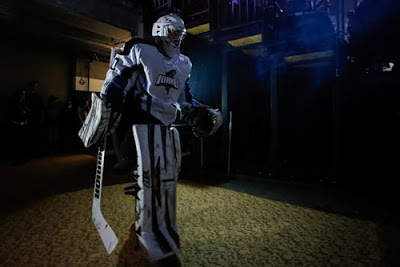 He accomplished the feat on April 14, 2012 when he beat Oklahoma City goaltender David LeNeveu at 5:35 of the second period in front of a sellout crowd at Cedar Park Center. Hedden played four years of NCAA Division III college hockey for Neumann University of the ECAC West, helping the Knights win the 2009 NCAA D-III National Championship, the first in school history. Robinson, 23, re-signs for his second year with Texas after spending his first professional season with the Idaho Steelheads, the Stars’ ECHL affiliate. The Frankenmuth, Michigan native played in 39 games for Idaho during the 2012-13 season, posting a 27-8-1-3 record, with a 2.57 goals-against average (GAA), a 0.925 save percentage (SV%) and five shutouts. Robinson ranked second in the ECHL in wins, shutouts and SV%, fourth in saves (1,245), sixth in minutes played (2,362) and ninth in the league in GAA. He also appeared in 13 post-season games for the Steelheads during the 2013 Kelly Cup Playoffs, earning a 5-7 record with a 2.50 GAA, a 0.919 SV% and one shutout, leading Idaho to the Western Conference Finals before losing to the Stockton Thunder in five games. Robinson was recalled to Texas twice last season and served as the Stars backup goaltender for three AHL games. 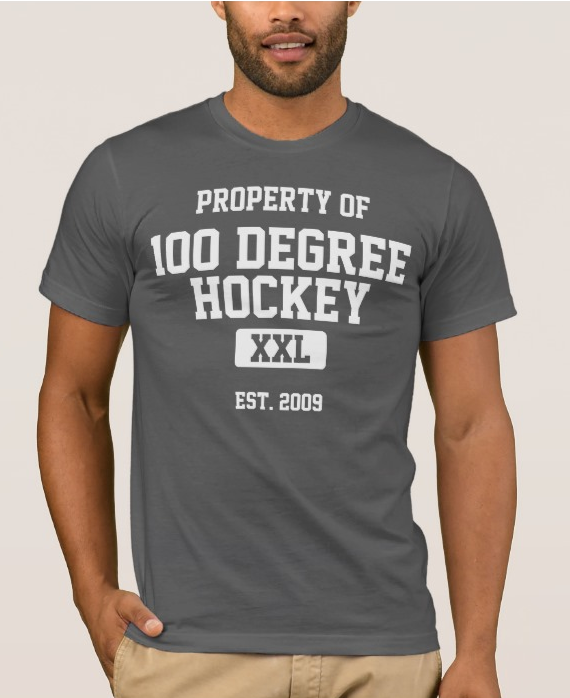 He was undrafted after playing four years of NCAA Division I college hockey for Michigan Technological University of the WCHA. With the addition of the Utica Comets, departure of the Peoria Rivermen and the relocation of the Houston Aeros, it was inevitable that a little bit of divisional realignment was coming to the AHL this summer. What came out of it is a nasty mess for the Texas Stars, who find that their new division spans the entire North American continent and four time zones. Stretching just under 2300 miles by air east to west, Texas will face off with Oklahoma City, San Antonio, Abbotsford and Charlotte in the newly renamed 'West Division' in 2013-14. This chain of events, that sees the Checkers starting away games against a divisional opponent at 10 PM local time and Abbotsford at 4 PM, was set into motion by the Canucks' purchase of the Peoria Rivermen. Their decision not to keep the team in Peoria and move them instead to Utica forced the AHL's hand here as they wanted to keep a 15/15 West to East split. Utica stayed in the West but needed a new division. They slide into the North Division, replacing Abbotsford, as Iowa moves into the Midwest to replace the now vacant spot previously held by Peoria. The overall divisional alignment is pretty good. You have to ask, really, what other choice did the league have? There are a few teams that have good arguments to move East (Charlotte being tops on the list) and they've all got more tenure than Utica. So where do you put Abbotsford? It's so much out on an island that it causes real travel headache for the whole conference. Earlier news that Peoria might have relocated to Seattle is now made doubly bitter as the Coyotes have stayed in Arizona. The potential failure of the arena deal in Glendale and subsequent likely move to Seattle was one reason why the move was blocked. Yes, Texas probably would have ended up in a division with the Seattle AHL team, but it would have made a little more sense. You could chain a few games together up there and the Heat and Seattle could play 12 games against each other with just a bus ride between them. The economics make more sense. Of course, given that the Abbotsford club is guaranteed to break even using city money, who knows what sort of economic calculations went into this decision. The Stars, who are the reigning South Division Champions, will now add the Abbotsford Heat to their division alongside Charlotte, Oklahoma City and San Antonio and the division will be renamed the West Division. Other changes from last year’s alignment include Iowa being placed in the Midwest Division and Utica being slotted in the North Division. The trade with Boston sort of obscured another bit of news for the Dallas Stars over the past twenty-four hours: the signing of defenseman Jordie Benn. After initially having a three year contract announced by his agent on Twitter a few days ago, the Dallas Stars confirmed that contract yesterday. The deal is two-way in the first year and two-way in the second and third years. This deal suggested that the Stars are confident in Benn's ability to mature into a 6/7 swing man for the club longer term. It is a pretty incredible story for the player once best known as "Jamie Benn's brother". 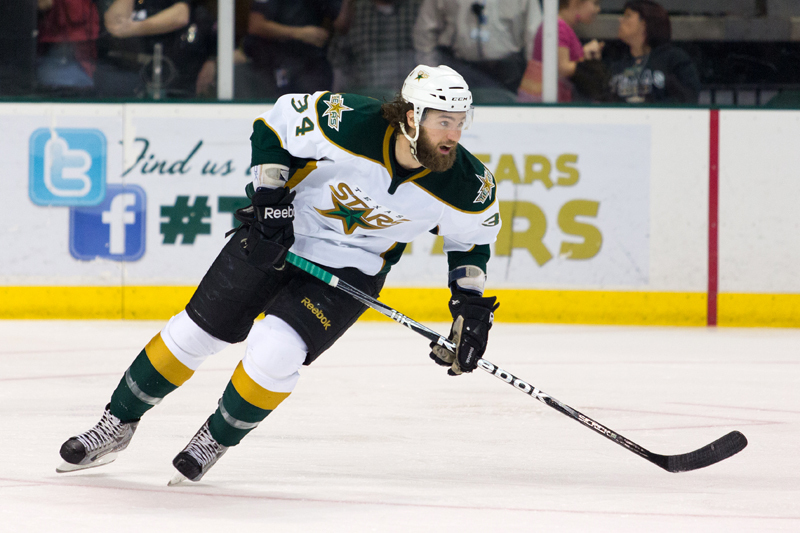 After starting in the ECHL and CHL, Benn signed in Texas. He didn't get into many games to start but then found his way onto the roster and played so well that Glen Gulutzan couldn't take him out. That play earned him a Dallas contract, which has now turned into this three year deal. He's played 29 NHL games and scored eight points. When he was playing in the CHL, I don't know if many thought that Benn would end up in the NHL. Now, he's got three-year NHL contract. The Texas Stars announced today that the Dallas Stars, the club’s National Hockey League affiliate, have signed defenseman Jordie Benn to a three-year contract. As per club policy, terms of the deal were not disclosed. In addition to his time in Dallas, Benn also skated in 43 games for Texas, the Stars’ top development affiliate in the American Hockey League (AHL). He finished fourth amongst team defensemen in points (7G-14A-21P) on the season. Benn has appeared in 165 career AHL games for Texas, which ranks seventh on the team’s all-time list, and he has 65 career points (18 goals, 47 assists), which ranks 10th all-time. So much for a vacation. The Dallas Stars made a blockbuster trade today with major ripple effects down into the minor leagues. Dallas acquired centers Tyler Seguin and Rich Peverley and defenseman Ryan Button from Boston in exchange for wingers Loui Eriksson, Matt Fraser, and Reilly Smith along with defenseman Joe Morrow. Matt Fraser and Reilly Smith have been big contributors in Texas over the past two and one seasons respectively. Obviously the loss of the all-time leading goal scorer in Fraser and one of the team's top points-per-game producers in Smith is a pretty rough one-two punch. However, there is talent coming along the pipe, some of which was previewed such as Brett Ritchie. 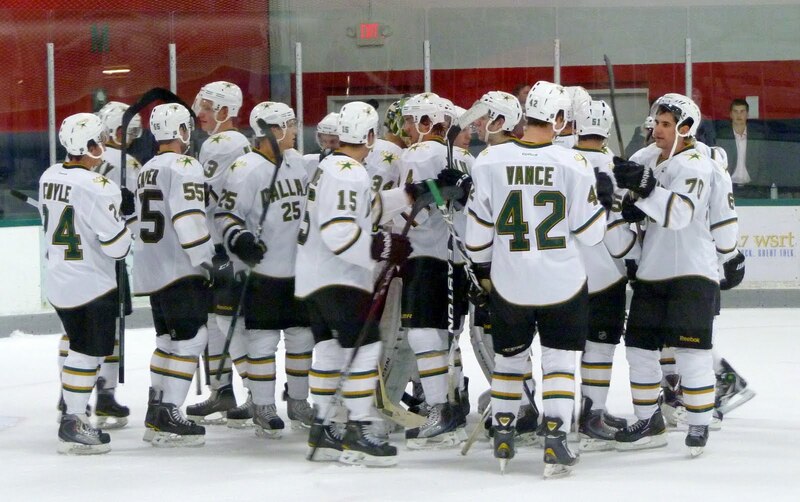 In the end, the Texas Stars primary purpose is talent development. While most of the time it is nice to see that talent develop and then stay in the system, seeing that talent leave the system is also a positive sometimes. Matt Fraser, an undrafted free agent, has matured into a player that dominates the AHL level and has a crack at the NHL level now, perhaps in Boston. The Bruins saw what he did in Cedar Park and put a value on that, hence his inclusion in the trade. Again, it's a tough hole to fill, but the Stars hope to see players such as Ritchie step up into that goal scoring role. In my opinion, the loss of the scoring from Fraser and potentially Smith, in the case that he would have made the AHL roster instead of Dallas, makes secondary scoring even more important for the team. 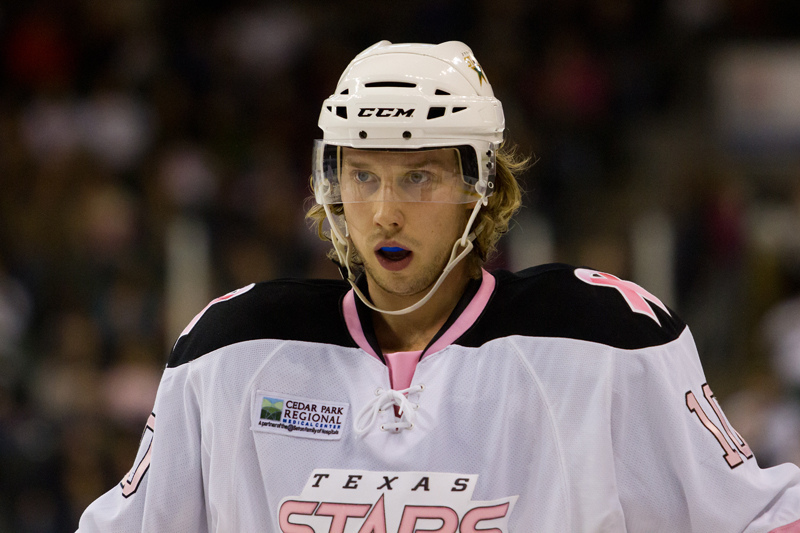 Mike Hedden should be a priority for the Texas Stars in the coming days. The two sides have been having talks. Also gone in the trade is Joe Morrow, who saw action in all but one game after his trade to the Dallas system. Morrow has now been traded twice in four months. It seemed like the performance he had in Cedar Park did not match expectations of him. The Stars received Ryan Button on the blue line in his place. Button was a third round pick in 2009 by Boston. He played in the WHL, mostly with Prince Albert, but also seeing time in his final season with Brenden Dillon and the Seattle Thunderbirds. Kirk Luedeke, who covers Boston prospects, had this to say about Button: "Mobile shutdown, bottom-pairing guy, real good character. Has the tools to be more, could just never apply them." Button spent some time in the ECHL over the past two seasons and has yet to tally a goal at the AHL level but has 3 points. Finally, yes, there are a lot of people who are going to be upset about the Texas Stars losing some top talent and getting what seems like to them a rather meager return. However, the number one goal of the Dallas Stars organization is to win a Stanley Cup. Players on the roster are all tools in the GM's toolbox to get there. When a trade comes across the table, the work that the Stars have done to develop players can help make those AHL players valuable pieces in the trades. Those trades make the Dallas Stars better and move them closer to the Cup. To say that this wasn't a good deal for either side isn't a fair analysis. Boston gets scoring wingers, including the centerpiece of the trade for them, Loui Eriksson. Eriksson is a big scorer in his prime or perhaps just past who can help the Bruins right now. Dallas gets two centers, which immediately shores up that position, and allows them to move Jamie Benn back to his natural wing spot. If you want to try and make the argument that Jim Nill doesn't care about the minor league team, take a look at the Grand Rapids Griffins, which were under Nill's management this season. They just won the Calder Cup. It's an argument that doesn't hold water. Valeri Nichushkin, the Stars first round pick in Sunday's draft, is a rare first round pick eligible to play in the AHL immediately after the draft. Because he is coming from the KHL, instead of the CHL, the transfer rules we are used to do not apply. However, Nichushkin is also the sort of player that could make an NHL impact in the first year after his draft. Unfortunately for Texas fans, he is likely to start the season in Dallas and has specifically stated that he would come to North America next year as long as he didn't have to play in the AHL. It's sort of unclear what should be gathered from that statement. In a perfect world, any draft pick would say they were willing to go wherever the organization wanted them in order to ensure they had the best chance to develop into a consistent NHL contributor. However, fairly or not, Russian players have developed a reputation for turning down chances to play in North America, especially in the minor leagues, in favor of the KHL ranks. The other players drafted on Sunday may not get to the pro ranks for a few years. For comparison, the Texas Stars' coming rookie players for this next season were mostly drafted in 2010 and 2011. That puts your potential AHL ETA for players like Jason Dickinson or Remi Elie at 2015-16 or 16-17. Until then, you can monitor their growth as sites like Defending Big D track their progress.